The Pacific Northwest suffers every year under rainy skies. Some locals soak up the darkness and put that energy into their art. A different energy emerges from Kathy Gore Fuss’ work at Prographica/KDR. She has distilled the forest onto surfaces that glow with the energy of slow, thoughtful growth. 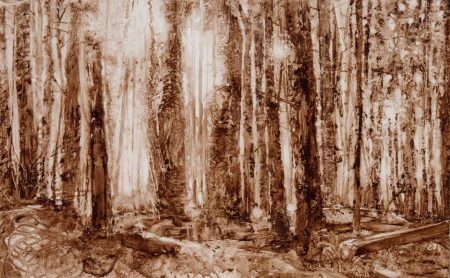 Her use of a synthetic paper brings her work a modernity of spirit despite the visible yearning for an untouched woodland. 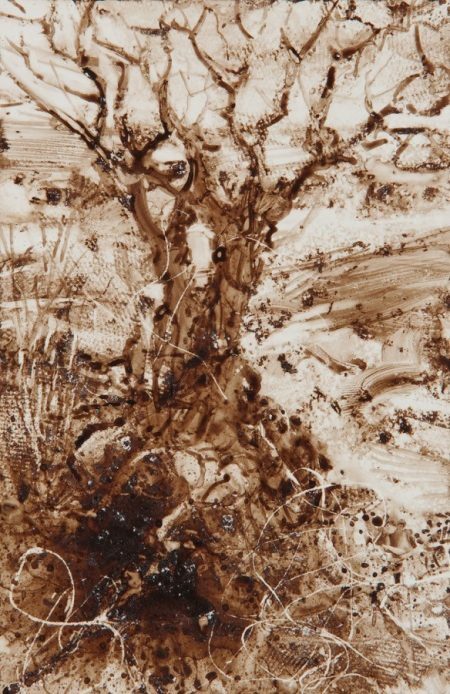 In these new works, she experiments with the way ink moves and dries on this impermeable surface. Her marks are varied and masterful, making full use of the fluidity of the medium. The haunting way the light comes through her inked trees in “Timber” captures the feel of a sunny day in the winter. The light is hazy, barely causing shadows, allowing the full richness of the forest’s textures full play. 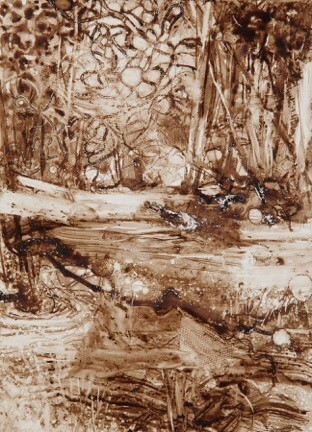 The passage in the foreground shows ink worked wet, implying the moist earth that feeds the vegetation. “I Call This Home” is an intimate piece displaying total mastery of the medium. In the lower left, it appears that the ink has crystallized around a piece of string that was lowered looping, then pressed flat and subsequently removed. The luminous character of the ink drawing is not fully captured in this image, which glows under the lights of the thoughtful installation. 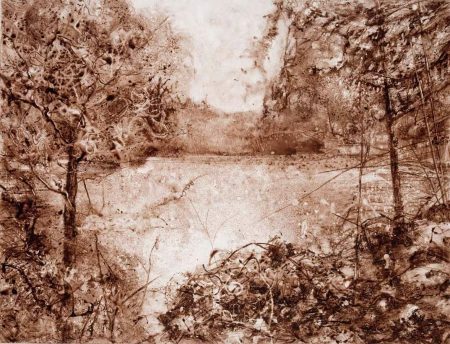 In “Nature’s Reward,” the endless variety of marks are positioned on the paper in seeming disregard to representation, recalling the way the minute daily changes of the forest add up to vistas that please the eye. “I Walked Along Side You” displays a vibrant, bubbling energy that suggests summer. Similar vibrancy is used to stark contrast in depicting the single wintry tree in “Riverbank.” Here it is the river that contains chaotic energy. The tree’s roots appear to have an uncertain hold on the soil assailed by the roiling river. 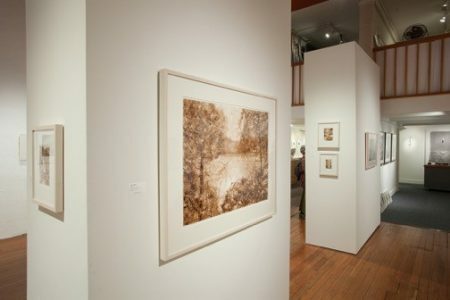 In “Watershed II,” the ink has been blown across the paper while wet, creating a natural sense of rootedness. These trees are reflected in the water they soak into their roots. We are reminded how important trees are to maintaining the freshness of our drinking water.